Look at those beautiful white teeth! Keep the teeth of your puppy or kitten healthy with regular brushing. 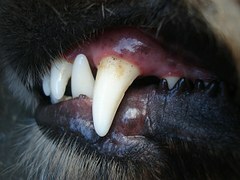 Stats on a lack of the habit look grim: by the age of 5, about 85% of all pets show signs of gum disease. But knowing that we should brush and actually doing it are two different things. How do you even get started on this important part of good oral care for your pet? Start Early. Your introduction will probably be easier with a kitten or puppy, so it’s recommended that you start early. Helping an older dog or cat get used to the habit of teeth brushing may take a little more time and patience, but it’s not impossible. Any of these reactions is perfectly normal – you’re only concerned with a happy introduction. After a few days of the random toothbrush within reach, you can start to actually brush your pet’s teeth. Your tool of choice may be an angled toothbrush, a “finger” brush that fits over your index finger, or even a clean rag that’s wrapped around your finger. Choose your time wisely. After a good long walk or play session, your pet should be settled down, more relaxed and hopefully ready to try something new. If you only brush one or two teeth and your dog starts to back away, your time’s up. Put away your brush or rag, hand over a treat and praise her with your soothing voice. You want to continue with your happy introduction, and tomorrow’s another day. Watch for any change in appetite or eating habits. 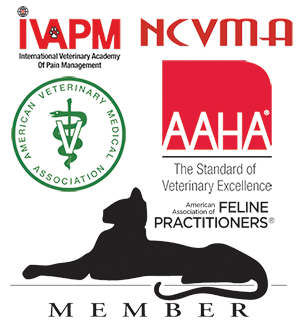 Pets should visit the vet to have teeth examined professionally every six to twelve months. Just as in humans, bad oral health can lead to problems like heart, liver or kidney disease. The fringe benefits of brushing your pet’s teeth are certainly worth your time – good oral health positively affects the life span of your pet. That’s why we’re offering free oral exams between right now and the end of March. When you come for your pet’s appointment, you can find out more about your pet’s dental health with complimentary educational materials, help with a home dental plan, and if needed, an estimate for a professional cleaning. Give us a call – and let’s get started!